There's a reason we're Durham Region's oldest plumbing company — "Service made us!" As Durham Region's oldest plumbing company, Vaillancourt Plumbing has been serving the plumbing needs of both residential and commercial customers since 1955 — a testament to our customer-centric approach to our business. As owner Ed Vaillancourt says "Service made us!". Although daily operations have passed forward to Ed's son, Brian Vaillancourt, Ed still advises, drawing upon his many years of experience and expertise. We are committed to a high-level of quality workmanship and customer care when it comes to your plumbing needs. Our expertise, friendly service and competitive rates will ensure you receive the exact repairs you need. 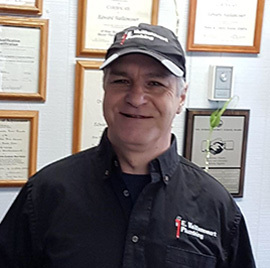 As our longest standing Team Member, “Stan the Man”, with a thorough understanding of E. Vaillancourt’s operations, is our go to guy, bringing his knowledge to bear with all our Team Members and customers alike. Stan’s insistence on keeping our job sites clean and tidy has drawn many positive comments from our customers. 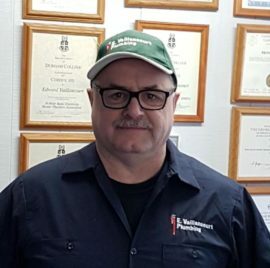 With over 25 years experience in residential and commercial plumbing and with his vast knowledge & skill set in renovations, Mark is the plumber you want for all your kitchen and bath projects. From start to finish, he can do it all! 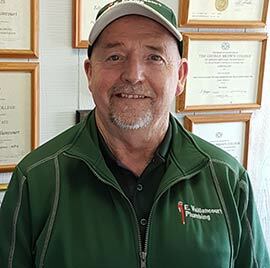 Having owned and operated his own successful business for many years in Lindsay, ON, Paul decided to sell the business and move to Durham Region to be closer to family. We’re glad he did! As an excellent general plumber, Paul also specializes in well pump repairs and replacement. No team is complete without the energy and enthusiasm of the younger generation. 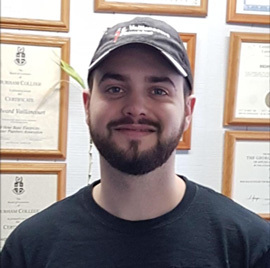 Conscientious and studious, Brandon is poised to provide many years of excellent customer service to the residents and businesses of Durham Region. First time I've ever called a plumber — what a great experience. The serviceman Paul who came was great. He was very friendly, knowledgeable and tidy. I will definitely use them again if needed. I highly recommend this company.